Combine all ingredients except chocolate chips, beat with mixer until smooth. Bake at 30-35 minutes in 2 8″ or 9″ round pans. Check with toothpick for doneness. Be careful not to over bake. Cool completely & ice with Bailey’s Buttercream Frosting. Cream the butter, add ½ of the powdered sugar & blend well. Add the cocoa powder & vanilla. Start pouring the Bailey’s over the icing while your beaters beat the rest of the sugar. Keep adding Bailey’s until it’s all in there. Pour ¾ shot of peach liqueur into a shot glass. 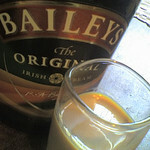 Drizzle Baileys into it, to fill glass. If done correctly, the Baileys will float in the schnapps. Then place a few drops of grenadine into the shot. 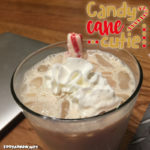 With tall shot glass, pour halfway full with peach schnapps, then layer the rest with Baileys. Place a few drops of grenadine in.